This is a gorgeous little gem of a book. If you love books you will revel in the setting; a small-town bookshop run by the tetchy young widower of the title whose high-faluntin’ literary tastes and anti-social demeanour have succeeded in alienating the close-knit community into which he married. 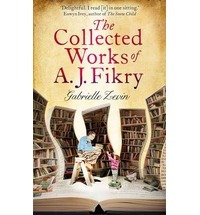 When a baby is left in his shop AJ is forced to examine his life and what it has become. As a result the acerbic shield he wears begins to break down and what follows is a gradual exploration of AJ’s values and relationships. I didn’t find I warmed immediately to any of the characters, AJ or the supporting cast, almost all of them underdogs in some way, but this was quickly overturned as the author gently reminds us that we are all flawed and that life is simply a series of choices we make. There is such charm in the happiness found by these individuals through their shared love of books. As the reader you will find yourself cheering them on when all is going well and crying with them when it is not. It is interspersed with AJ’s comments on his favourite short stories, which would be fun to read alongside a subsequent reading. I read this in a couple of days but it is lingering on in my mind, really lovely.